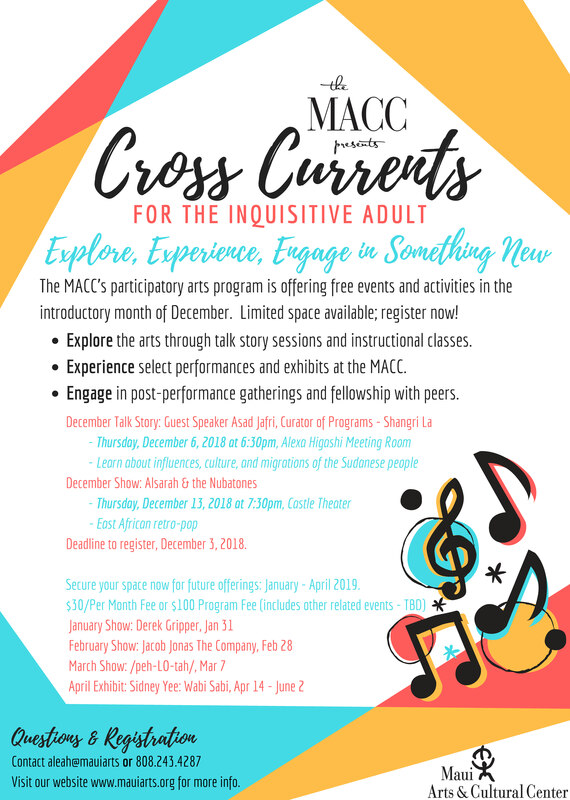 Cross Currents: arts education sessions for inquisitve adults. 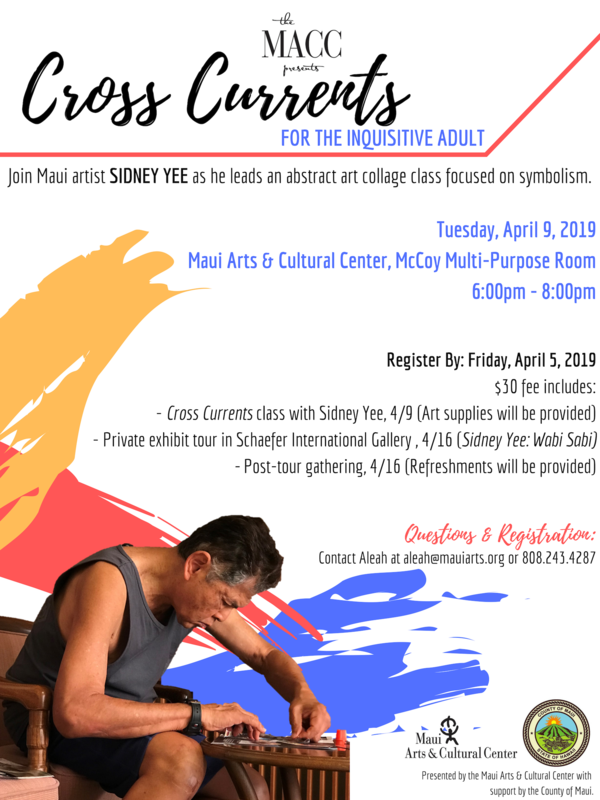 Join Maui artist SIDNEY YEE as he leads an abstract art collage class focused on symbolism . 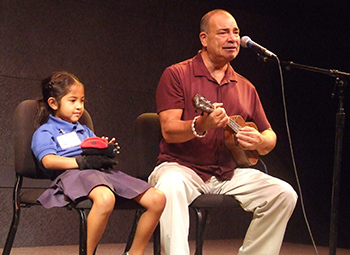 Explore the art of modern dance with Amelia Couture of Maui's Adaptations Dance Theater. 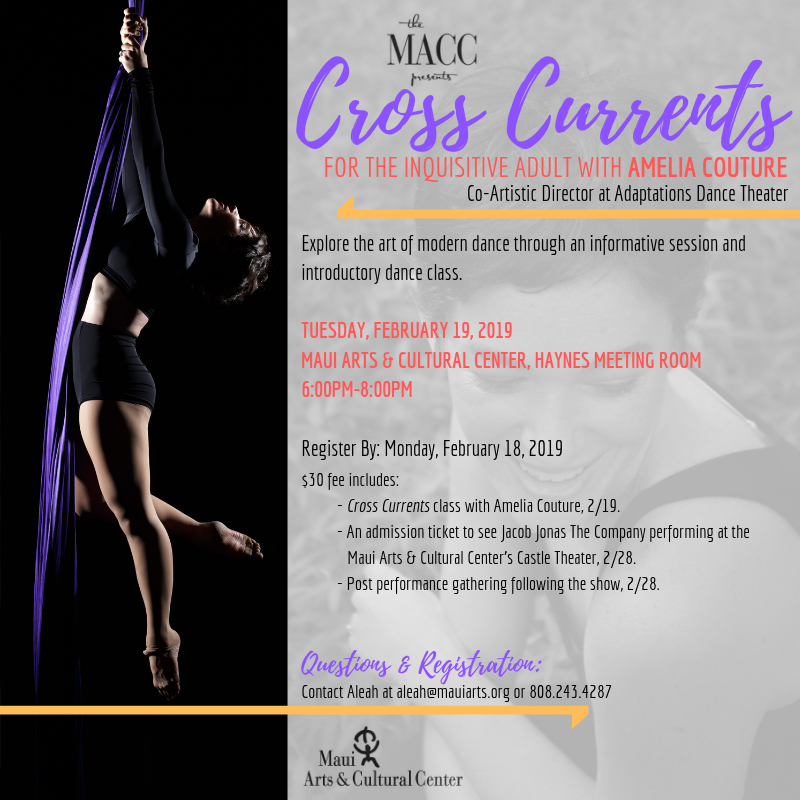 Cross Currents class with Amelia Couture on Tuesday, Feb 19. 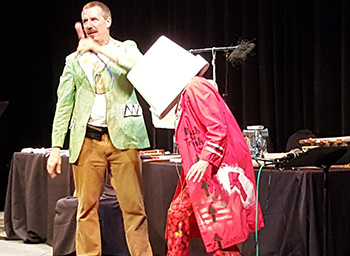 An admission ticket to see Jacob Jonas The Company performing at the MACC's Castle Theater on Thursday, Feb 28. Post-performance gathering following the show on 2/28. NEW PROGRAM as of December 2018 - runs through April 2019! The Cross Currents program was first offered to adult performing arts students (18+) in June 2017. Thanks to the positive feedback and suggestion of our participants, MORE Cross Currents explorations were offered Jan 3 - April 25, 2018. Each month, an art form was explored: January, Music; February, Dance; March, Oratory; April: a mixture of music, dance, drama learned in previous months, to keep up the skills developed. Building a community is a big component to the Cross Currents experience. Experiencing the arts with old and new friends adds a extra depth. 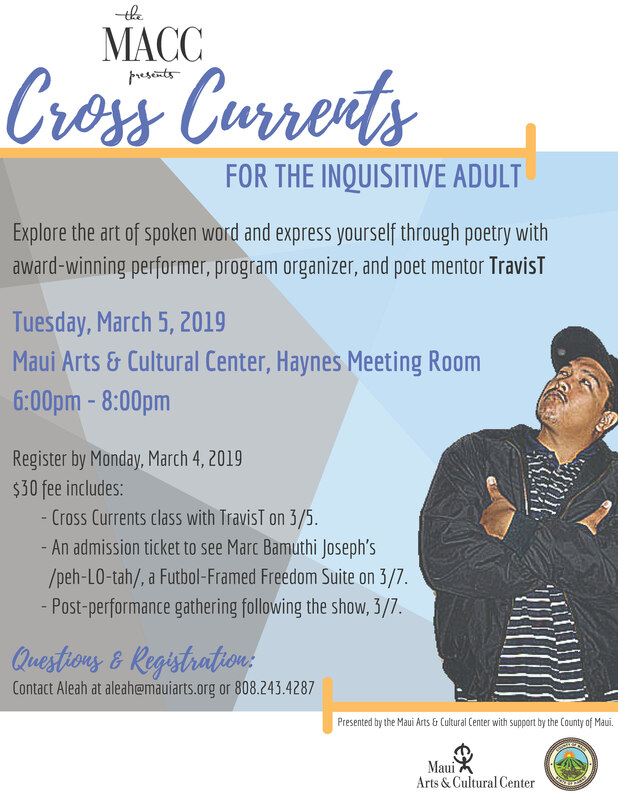 We hope you can join us in the next Cross Currents... and please invite friends who would enjoy the experience, too! 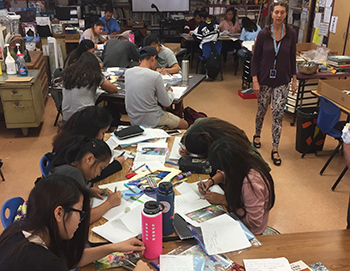 Research shows that the arts can transform teaching and learning environments, as well as increase learner engagement and connections to the surrounding world - thereby raising student achievement and success. 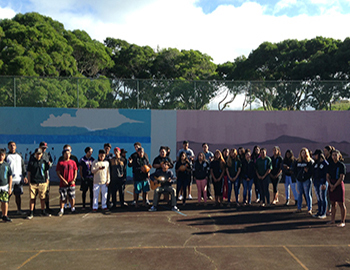 The MACC utilizes teaching artists on three levels: federal (Kennedy Center and NAEA); state (Artists in the Schools); and local (artists and cultural practitioners in Maui county). All three of these levels bring strengths and expertise that meet the needs of our community. 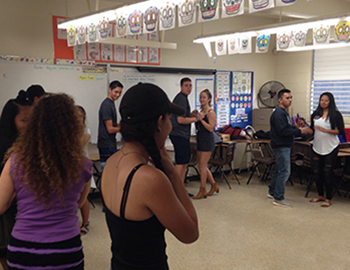 Whether it is working with students or educators, or bringing cutting edge arts strategies and/or cultural sensitivity, the MACC's education departmental goal is to use the arts to enrich the lives of our community. 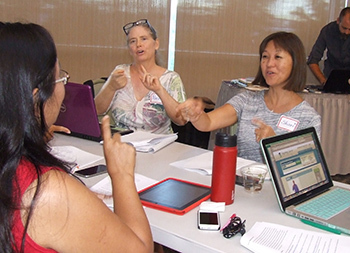 Keeping in mind the long struggle of arts being under-funded across the nation, we have found incredible success when our teaching residencies are focused on arts integration. Arts integration is where teaching artists go into schools and collaborate with classroom teachers and find innovative and relevant ways to infuse classroom instruction with the arts, raising engagement and leveling the playing field for different types of learners, and inspiring confidence in and through the arts.